ITHACA, NY -- When he was 2, Jeremy Shuler was reading books in English and Korean. At 6, he was studying calculus. 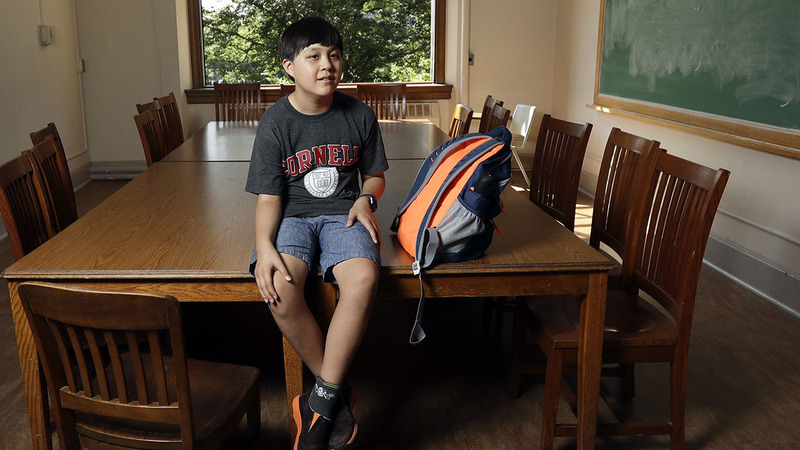 Now, at an age when most kids are attending middle school, the exuberant 12-year-old is a freshman at Cornell University, the youngest the Ivy League school has on record. "It's risky to extrapolate, but if you look at his trajectory and he stays on course, one day he'll solve some problem we haven't even conceived of," said Cornell Engineering Dean Lance Collins. "That's pretty exciting." Jeremy is the home-schooled child of two aerospace engineers who were living in Grand Prairie, Texas, when he applied to Cornell. While Jeremy's elite-level SAT and Advanced Placement test scores in math and science at age 10 showed he was intellectually ready for college, Collins said what sealed the deal was his parents' willingness to move to Ithaca. Jeremy's father, Andy Shuler, transferred from Lockheed Martin in Texas to its location in upstate New York. "I wanted to make sure he had a nice, safe environment in terms of growing up," Collins said. With his bowl-cut hair, cherubic face and frequent happy laughter, Jeremy is clearly still a child despite his advanced intelligence. He swung in his chair while his parents, who he calls Mommy and Daddy, recounted his early years during an interview at the engineering school where his grandfather is a professor, his father got his doctorate and Jeremy is now an undergrad. "From the beginning, he was physically advanced, very strong," said Harrey Shuler, who has a doctorate in aerospace engineering but put her career on hold to home-school Jeremy. He fixated on letters and numbers at 3 months old, knew the alphabet at 15 months, and was reading books on his own at 21 months in English and Korean, his mother's native language. When he was 5, he read "The Lord of the Rings" and "Journey Through Genius: The Great Theorems of Mathematics" on his own. Enrolling him in kindergarten was pointless. "We were concerned about him socializing with other kids," his mother said. "At the playground he was freaked out by other kids running around screaming. But when we took him to Math Circle and math camp, he was very social. He needed someone with similar interests." Jeremy nodded vehemently at that, saying his closest friends are from the math discussion groups. "One of my Math Circle friends actually wrote 'Minecraft for Dummies,'" he said, adding that the computer game is one of his favorite pastimes along with reading science fiction. He said he's settling in to college life. "I was nervous at first, but I'm a lot more excited than nervous now," he said, adding that he's already made a couple of friends. "As Mommy said, all the kids in math camp were older than me, so I'm used to having older friends. As long as they like math." He's enjoying the classes, especially the theoretical discussions, he said. "The classes are kind of easy so far, but I know they'll be harder pretty soon," Jeremy said. That's an important thing to keep in mind, according to others with experience in early college. Joe Bates, founder of Singular Computing in Newton, Massachusetts, and a leading researcher in artificial intelligence, entered Johns Hopkins University when he was 13. Now 60, Bates said college was liberating after conventional schooling that always bored him. "It was actually the first time it was fun and interesting to be in school," Bates said. On a social level, he felt more at home with his nerdy college classmates than he had with junior high students. "If I were to give Jeremy any advice, it would be that it can be hard and you should not assume you can manage everything," Bates said, recalling how distressed he was when he found himself struggling with his doctoral studies at Cornell Engineering. "You should truly keep your parents and advisers informed, and ask them for help. It's not going to be like before, when you could just do everything." As for the future, Jeremy plans to just keep on learning. "I want to pursue a career in academia," he said.